@TonyGin&Juice you still tracking picks? I sent out an OSA draft tool to the usual suspects. If you didn't get it and you want it, PM me ur email address. Yes. I'll update this evening. Unless we're redoing the 2059 draft, I'm not sure it matters. But it is interesting to see how accurate Travis' draft tool was now that the 2059 guys have have a few seasons under their belt. Whoops. When I open it on my phone, I get 2066, but when I opened it on my PC, I got 2059. Prolly need to scroll through the rest of the email. There is only one best... if you are looking for return on ur pick, anyway. Why so salty you fucks? Traded Picks 2066 thread has been updated for 2066. Please let me know if any corrections are needed. 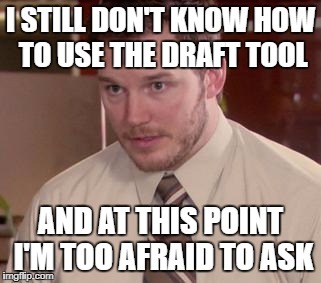 Could I get a quick rundown on the basics of what I need to know for the draft, like where can I see slot values and bonus pools etc? If it is more or less the same deal as the MLB then I should be good. Not sure if you have a login or not yet, but I believe the password is baseball. As for the other stuff, in-game shows what the prospects' demands are. If you look at SS Ulrich Rosen from the draft pool screen (in-game), his demand says $5,500,000, but if you click on his profile, his Bonus Demand says Slot. I use this to judge about how much a player will demand. Anybody looking to move up to #5 from the middle of the first round? OU and Lando trading goats. Is it 2042? Good picks so far for everyone. JD went with the safer option regardless of if he was aware of Ulrik's nationality. Bryant a good pick too, he vaulted into my Top 4 with his senior season. My last Swede didn't pan out too well, but Ulrik is somewhat developed already so that helps. Ortiz is the real deal though. That power will be cray in Dam. Buffalo pick will happen soon, our WAR ROOM is heating up! @bruin228 @bruin, now is your chance to way in as our special advisor! Who has high contact, no eyes, and SEC SPEED? False, the last one posted was an It's Always Sunny vidya. If you guys are patient and let him learn all the positions throughout the minors, he'll still be useful. Granted not like you'd hope for a top 5 pick but still. He'll basically be a HORSE LEE Replacement. We have 4 guys like this already but he was probably BPA and maybe he overachieves. I mean at worst he's Lucas Trembath if you take your time.